Gloxinia (sinningia speciosa), an herbaceous plant valued for its large ornamental flowers and attractive foliage, is capable of blooming any time of year. The plant usually blooms for the first time about four to 10 weeks after planting. Gloxinia produces flowers in shades of white, orange, pink, blue, red and violet, depending on the cultivar. Native to Central and South America, gloxinia requires a warm climate to thrive and grows best indoors throughout most of the United States. A popular gift plant, gloxinia is often discarded after blooming ends, though with special care, it may bloom again the following season. 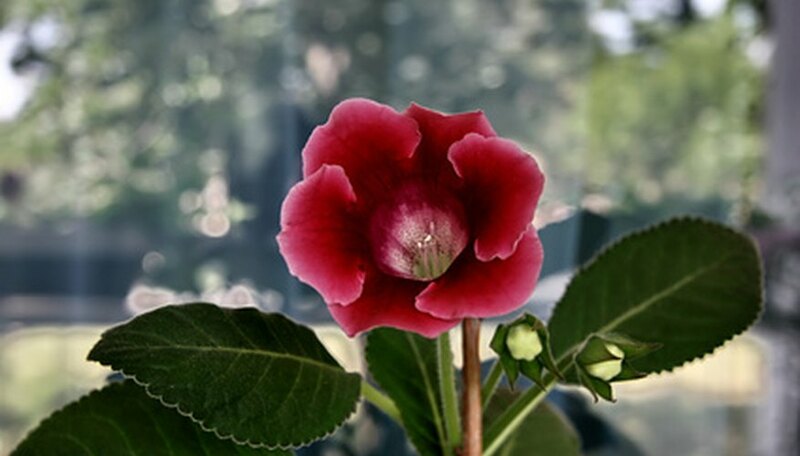 Keep gloxinia in a location that receives bright, indirect light throughout the day, such as a north- or east-facing window. Maintain a regular temperature of 65 to 75 degrees F during the day and 55 to 65 degrees at night for optimal growth. Run a humidifier near gloxinia at all times to raise the relative humidity of the air around the plant to necessary levels. Replenish the water in the humidifier as often as necessary to keep it full. Water gloxinia plant from the bottom once per week to provide the soil with the moisture it needs without wetting the leaves. Fill a saucer with water and place the plant's container on the saucer. Replenish the water in the saucer until the soil is no longer absorbing moisture. Feed during winter to provide plenty of nutrients for growth and flowering. Use a liquid houseplant fertilizer at half the strength recommended by the manufacturer to prevent over-fertilizing. Stop watering gloxinia and transfer to a cool, dark location for six to nine weeks immediately after flowering ends to induce a rest period. Re-pot the plant in a slightly larger container with a fresh growing medium when new growth appears and resume regular care procedures. Use only room temperature water, as hot or cold water may shock your gloxinia plant. If a humidifier is not available, place the plant's container on top of a tray filled with pebbles and water to raise humidity. Do not mist gloxinia, as the plant cannot tolerate wet foliage.